Halloween, or All Hallows Eve, is one of the times that harmful spirits are said to be active. In the U.S., we take that concept to mean that witches, among other spirits, are out that night seeing what mischief they can get into. Since we link witches and Halloween together, it is not uncommon to see Halloween cover illustrations for popular magazines that show a witch out riding her broom, like Owen Smith’s New Yorker cover seen here. 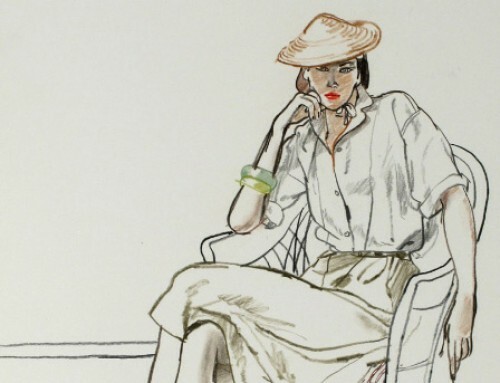 Among my many favorites of this theme of illustration are the two seen below. 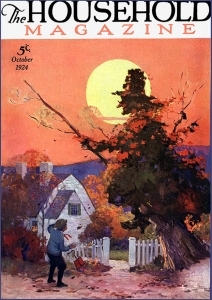 J. C. Leyendecker’s October 1923 cover for The Saturday Evening Post and the October 1924 cover illustration for The Household Magazine created by an unnamed illustrator. 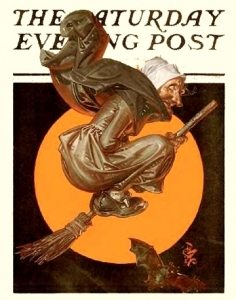 According to Dave Saunders, J. C. Leyendecker’s cover (see above) was a mocking response to his brother, Frank X. Leyendecker’s October 4, 1923 cover illustration for Life magazine that showed a blond-haired pretty modern witch riding on a new electric vacuum cleaner. * The Household Magazine’s witch is a trompe-l’oeil construct cleverly visualized from the outline and shape of an old tree and its color-shifting leaves seen against a bright full moon. 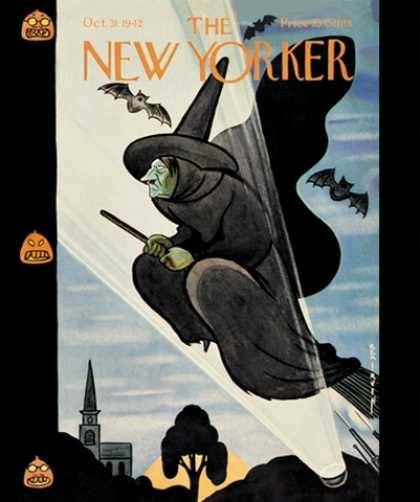 In October of 1942, illustrator and New Yorker art editor Rea Irvin created a Halloween cover illustration of a witch riding her broom accompanied by bats. Because that cover was created during the war the witch is shown caught in the beam of a sky-watching search light. 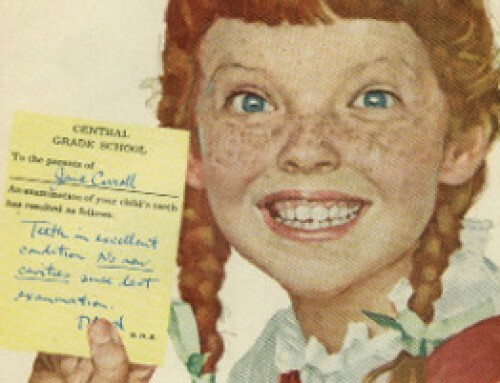 The blast of light reveals that the green-faced witch is really Adolph Hitler. ** Notice the grimacing pumpkins along the left edge of the magazine cover’s binding margin. 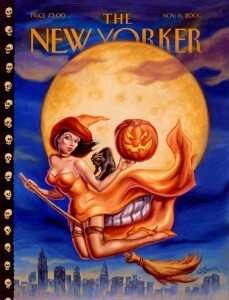 What makes Owen Smith’s Halloween 2000 above cover so memorable is his clever marriage of a variety of genre styles. The over-arching aspect of this illustration is obviously the traditional image of a witch riding her broom. What is unusual about this pretty witch is that her garb is colored in an uncommon shade of orange and that her looks have more in common with a scantily clad pulp-fiction illustration than a typical Halloween black-garbed witch. 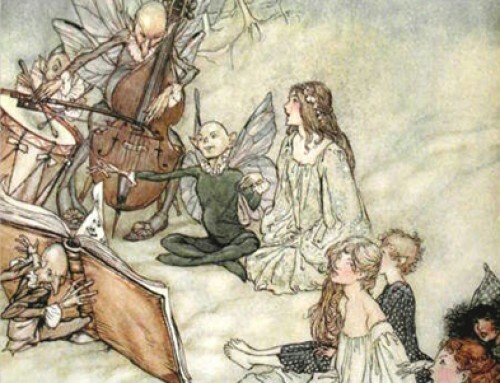 It’s a variety of Owen Smith’s details that make me smile: the way he represents the active motion of flight by showing the witch’s hair and hat as being blown back by the force of the wind (even the cat’s fur is being blown back by the flight); the same is true of the long skirt of the witch’s dress, blown back to reveal her gartered stockings framing her shapely legs; and finally I love that Smith has paid close enough attention to cause and effect to show how the garter snaps pull against the fabric of the stockings and distorts the weave as though a line of thread has been pulled. At the same time logic insists that also I question just how her strapless bodice stays up? O O O O o o o o o o o . . . Happy Halloween! ** Adolph Hitler, stood as the ubiquitous face of the Nazis, who were exterminating those deemed as undesirables in concentration camps, such as Jew at Auschwitz, and liquidating the Czech town of Lidice as a reprisal for the killing of Reinhard Heydrich, the Nazi Deputy Protector of Bohemia and Moravia among many other heinous acts. 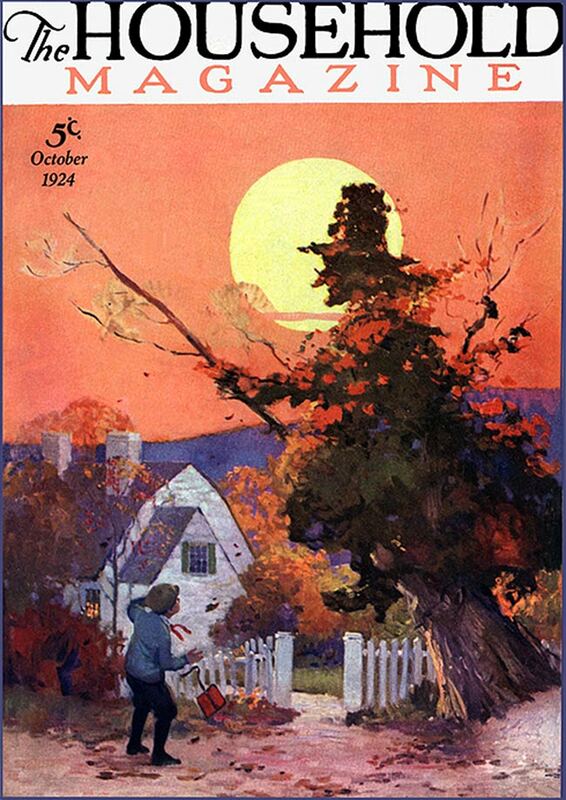 The prior year’s Halloween week’s cover illustration (November 22, 1941) was also by Rea Irvin. It showed a white-gloved and white-tied butler opening a front door to a group of trick or treaters only to find the young boy in the foreground of the group wearing an Adolph Hitler mask face and holding out his hand for his bribe. 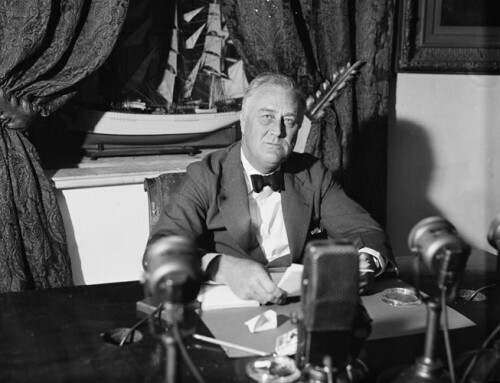 In October of 1941 the Germans had taken Cracow and Odessa and by November 11 the Germans had captured Yalta in the Crimea. The cover’s implication is that Hitler was threatening, ‘give me what I want or I’ll just take it’. *** William Shakespeare, Hamlet (1602).